This is a fabulous example of East Kingdom scribal talent that you can own and hang on your wall. It's also a great way to introduce family and friends to some of what we do in the SCA. Why am I plugging the calendar? 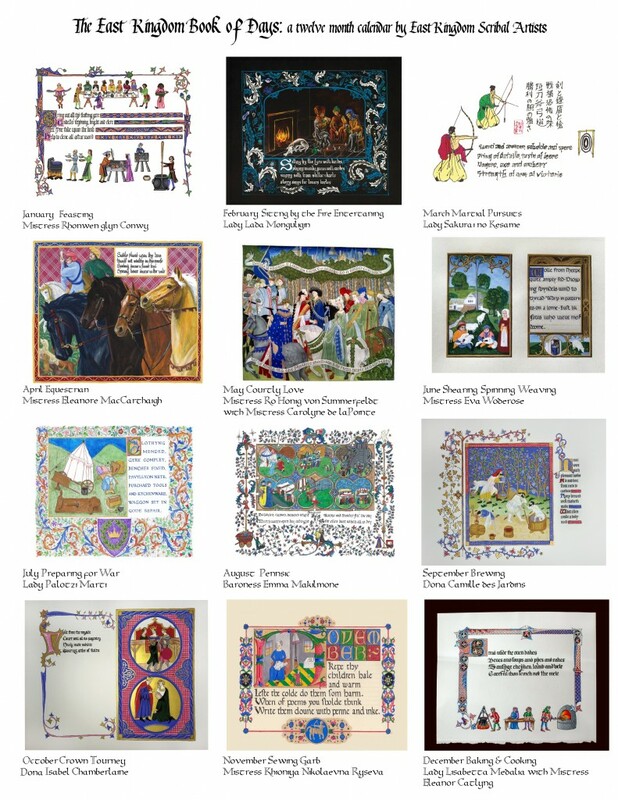 Besides the fact that my Laurel, Mistress Carolyne de la Pointe, and apprentice-sisters Mistress Ro Honig von Summerfeldt and Dona Camille des Jardins worked on this project? Other than the awesome effort and talent that went into it? Beyond the fact that it's a great fundraiser? A couple weeks ago at the Endewearde Hunt, Baroness Aneleda Falconbridge asked me to pen the cover for it! I was initially hesitant to accept because she needed it done in about a week, and I had some other work on my plate. My apprentice-niece Lady Christiana Crane convinced me I should do it, and my lovely wife Adrienne d'Evreus patiently accepted another draw on my free time. Having said yes, I needed some inspiration. Have I mentioned how much I love today's world of digital libraries and Pinterest? A little stumbling around and I found Amanda Poirier-Kratz's Penwork and monochrome decorative Lettering Pinterest board. What a goldmine! Perusing it, I found an image from "A model book for scribes" by Gregorius Bock, ca. 1510-1517. A little more searching online and I found the full digital version of the model book on the Yale Library website. Done on Strathmore 300 Bristol Board, with Sumi Bokuju black ink and Winsor & Newton Scarlet red ink. Nibs were Brause 4mm, 2mm and pointed. I wanted to get this out there so people had time to order the Calendar before November 1st! Below are some images of the final work in various stages of completion. Step one: practice, practice, practice! 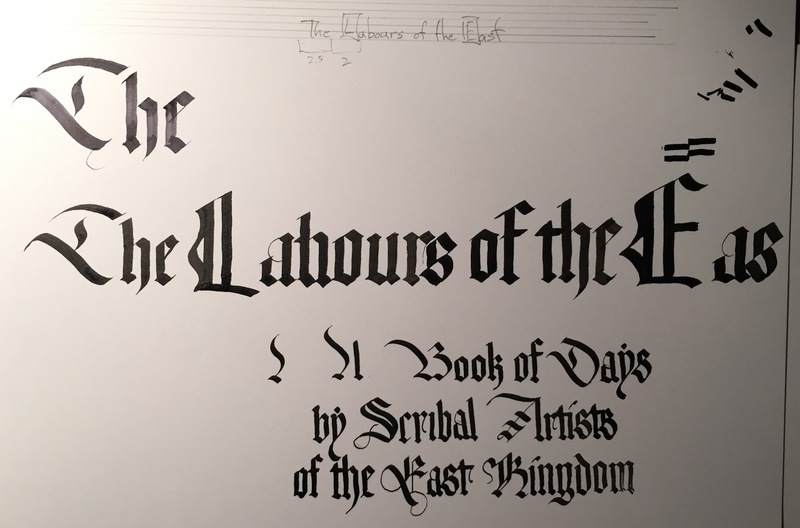 I started by free-hand (no lines) playing with different nib sizes and the title text to see how to fit it on the page. I learned that with a 4mm nib, I wasn't going to be able to fit the text on a single line and keep it under the 10.5" width. Rather than go smaller, I decided to split the line as you can see in the final result. This is a decidedly modern fitment method, and a conscious choice on my part. Step two: my first attempt. After lining and pouncing the page, I tried to pen the title. 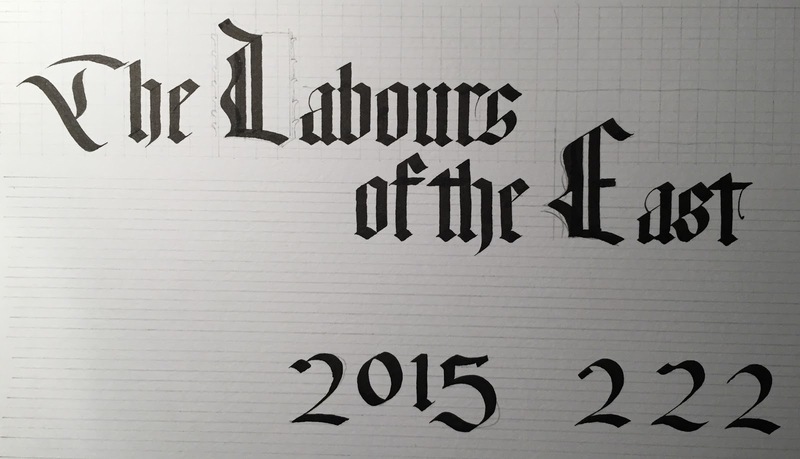 I made a mistake on the 's' in Labours. So this became a "careful practice" page. 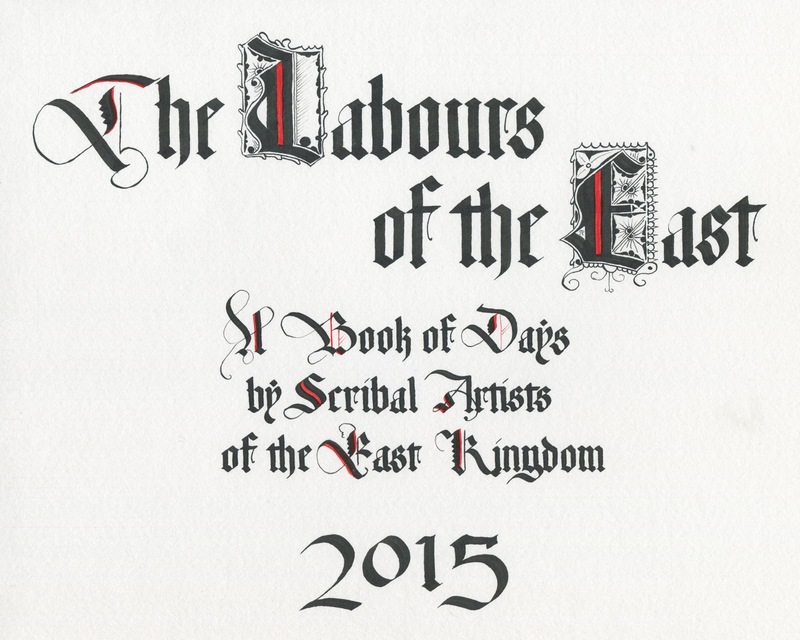 I added "of the East" to test fitment, then started over on a new page. Having successfully finished the title, I practiced the subtitle. I wanted to make sure I could form the capital letters correctly, and figure out the width of the completed lines so I could center them as much as possible. This was done freehand, no guidelines. This also allowed me to figure out what I wanted the 'k' and 'y' to look like as I couldn't find examples of them in my source. Below are three in-process images of the final page. You can see the numerous pencil guidelines I used, both vertical and horizontal. If you look carefully under the subtitle text, you can see that I even rough sketched the lettering in ahead of time to check width and centering. The L and E of course got special treatment. Before penning the primary strokes, I sketched them in pencil as well as a simple outline of where I expected the surrounding ink lines to appear. This also allowed me to space the following letters correctly. Once I had the rest of the page done, I went back and lightly pencil sketched where all of the ink lines would be drawn in. I careful went over the pencil with a pointed nib. I used the same pointed nib to add flourishes to and clean up the details on the rest of the text. Then I finished with the red ink for the highlights, using all three nibs.